Exceptional Windows- Aluminium Windows that we manufacture are to the highest standards in & around London. We Guarantee Satisfaction of the Windows we produce. Durable Aluminium Doors- We put a value guarantee behind our Aluminium Doors and windows. Bifold & Slide doors with the strongest frames. Flexible & Guaranteed Call outs are Free without Hassle and all our aluminium double glazing systems are backed by 10 - 25 years warranty whether its Aluminium casement range or external Aluminum Doors. Welcome to The Doorwins Group, the Aluminium Windows specialists and long-time aluminium Door fabrication company with over 40 years experience in Aluminum glazing , doors and windows with 10 locations in the UK. Here at Doorwins in London we put the customer first and always meet there demands to high standards with top quality prices. We bring the industries top brands in external and internal windows and doors and run a swift service to provide casement windows or bifold doors. Aluminium trade is our passion and we cater for commercial projects as well as home owners quarries. Commercial products include Casement, panoramic, curtain walling, triple glazing, bifold and slide systems on doors and many other designs made to fit in a bespoke manner. Residential home are welcome to take a look at our range of folding doors bifold or slide aluminium windows, sliding patio doors, lanterns, external aluminium doors, internal door, bespoke window designs and more. So maybe you have a deadline on your projects or you require a fast or particular time frame, remember Doorwins are here to help assist in profile choice, colours, bifold doors, sliding doors, casement windows, sliding aluminium window and many more designs in our massive range of thin frame and thick. No job is too great or too small for us, we welcome single window customers and commercial customers whom may require 40 windows and doors, to us its all the same so call today to make an online purchase or face to face enquiry at your home or our warehouse, call the team to help you choose and buy today. More about Doorwins Group here. Why choose Aluminium windows with Doorwins? Aluminium Windows are very versatile, robust and strong which are designed to withstand the most extreme weather conditions with exceptional acoustic performance. Aluminium windows are great at minimizing heat loss and keeping most noise outdoors plus Low E internal glass reflects heat back into the room, minimising any energy loss. Doorwins aluminium windows and aluminium doors fabricate to the highest standards making our windows virtually maintenance free and are built to last you a lifetime. Our window and door systems are Secure by Design accreditation, these are certifications that we must hold on all our materials which also falls in to our 10-25 years system guarantees. Doorwins provide the homeowner with the very best aluminium windows and doors and can help you choose correctly what you need and do not need. Most companies will up the bill but Doorwins have no commission based staff. Doorwins aluminium windows and doors in London are designed for efficient sound reduction, and are the best in the industry. We know for a fact that there is no greater comfort than having windows and doors that are durable and energy efficient at the same time. We ensure that our products are environmentally sustainable. Our products are built for outstanding reliability and performance. This assurance gives you the confidence that you are selecting products that are built to last. We understand that mould formation is one of the leading problems in homes, so the products we use are manufactured in such a way that they reduce condensation and heat loss. We offer aluminium doors and windows built from the sturdiest, finest materials in London that pass the most stringent standards. We offer warranties that protect your investment. Our vendors offer lifetime warranties to ensure value for money. With us, you will never have to pay the bill upfront. You will only be required of a down payment in order for us to buy the materials needed, and the remaining amount will only be due upon completion of the project. We understand that paying in full upfront means unnecessary risk on your part, so we meet you halfway so we can gain your trust. Aluminium windows and doors have a much higher beneficial factor over any other material with its wide range of more thinner frames and corner-less space saver options. Both Aluminum windows and doors are basically maintenance free due to the paint and powder coating used on them which have the special abilities to self-preserve these wonderful systems. The super strength of these Aluminum frames means that more visibility is a definite option offering more use of glass within the aluminum frames whether its windows or doors. When doors and windows become Draughty or start to jam that can be very much annoying but Aluminium frames do not expand in heat or contract in the winter making them perfect for all year round. To learn more about our aluminum windows click on the various products pictured above or contact our sales team. – Edwardian / Georgian style tough windows with a double overlapped vertical slide system give that spectacular look and feel. 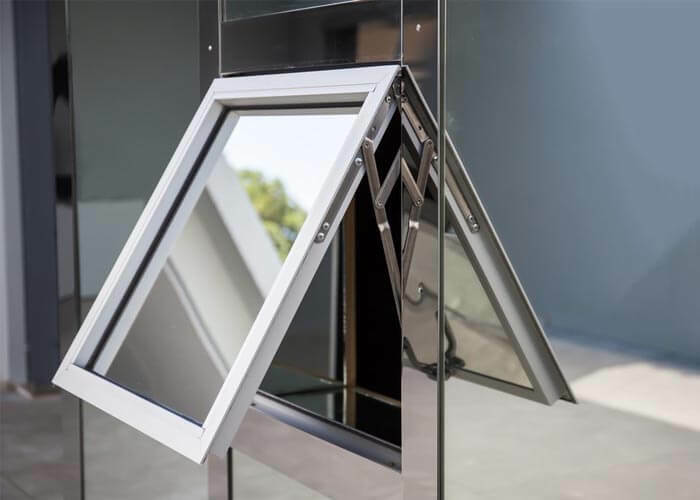 Tilt & Turn – These European inspired windows can tilt inwards (bottom hung), or open inwards from the side (side hung) and mainly found in high multi story buildings. Curve Shaped - accurately produce curved and arched windows, including circles, angles windows, D frames, as well as other custom bespoke shapes. Slim Frame Windows – this allows for a maximized viewing area for your windows. Panoramic Windows – They are large and spacious and are most suitable for family rooms. As the name suggests, they give a panoramic view of the outside. Roof Windows – our roof windows are built while ensuring security, function and ease of use. Sliding windows - used in residential and commercial properties and one of the more tradition aluminium window types. We also have displayed units and catalogues which supply fixed windows which have glass that stays in one place, hopper windows that are used mainly for basements with inwards openings for better ventilation and transom windows which has a cross bar in-between it and the door below dividing the two. The doorwins Group are renown for supplying and fitting sidelight windows, jalousie or louvered windows, clerestory windows, skylights, roof windows & lanterns, the very popular bay window, oriel & picture windows, emergency exit windows, stained glass windows, Alu French windows and not to forget Aluminium panel windows. Slim Frame Doors – this will give your home more character and help maximize the glass area. Aluminum Entrance Doors – Doorwin’s entrance doors are low maintenance, attractive, secure and energy efficient. Folding Doors - One that opens by folding back in panels, it provides better aesthetics and function. – This type saves space and adds style, giving any room a dramatic look. – This style is the future of space savers that also make the area of the house were used look much larger than before. 10 – 25-year insurance backed system guarantee for all our aluminium doors. Colour ranges and security types are advancing in a major way and we have all the new systems for you to choose from. Am I paying for corrosion proof, draft resistant seals, Low E internal glass and most of all security. Don’t forget that, as most systems require specialist fitting Doorwins company can accommodate all these factors. Aluminium profile is insulated with a polyamide core to help prevent heat transfer through the frame. In case of a fire emergency, most fires will not spread through these doors. Aluminum doors are the way if have family members that live at the property. A quick search will show you that crime and break ins were much lower to houses and commercial properties with aluminum profiles. Doorwins Doors meet the security requirements of British Standards Publication PAS 24:2012 and acts under FENSA guarantee. The bigger more expensive brands are Shueco and Kawneer which most architectural companies decide to use. Business and commercial premises require Kawneer over Shucco due to industry requirements were as homes and residential will require brands such as Aluk and schuecco. Doorwins can fabricate any make, brand and design to suit your needs so give us a call today and we can assist. The best aluminium fabrications can cost up to 8 times more than a standard pvc fabricator, company brands such as schucco or kawneer are much related to architectural projects. Reyners are a cheaper brand to schucco but never the less a very high quality window for the average home owner. Residential windows and doors will always be cheaper in price to a commercial aluminum windows or doors project. Commercial buildings require thicker frames and security set doors and residential doors can do with an interlock system making them much more affordable. Todays world consists of sleek designs and modern systems, whether it be a furniture for your home or office or an aluminium bifolding door. The slim line are more expensive '' now, i see you asking yourself 'wouldnt it cost more for a thicker design which consists of more metal within the frame?' , that would be the case of both slim line aluminium and thick aluminum were as easy to fabricate as each other. Slimline aluminium windows & doors will always be harder to make due to the fine sleek thinner frames, making a slimmer metal secure is harder than making a thick aluminium frame secure. Our doors and windows here at Doorwins will keep your home in London warm in the winter and cool in the summer. Our sash windows provide a tight fit so that the heat or cold does not escape it especially under extreme weather conditions. Our products are impact resistant and we are proud to say that what we offer are cost-effective solutions for hurricane protection. We stand by the quality of the products we use and we will be more than glad to visit you at your property to solve any issues that may arise. We hand out care and maintenance booklets for you to get the most out of the aluminium French doors and windows we install. Doorwins does not believe in high pressure selling. When you call us, we will provide you with the information you need, coupled with some experienced guidance on the selection and purchase of your items, down to installation and even aftercare. We will ensure you make the right decisions and it will be solely up to you to decide if you want to continue business with us. Our aluminium sash windows and doors in London will fit the architectural design you want because we can customize them to your liking. We offer made to order products so they can fit any opening. You should really take a good look at the window companies supplying you with your aluminium windows and doors in London. Here at Doorwins, our products are manufactured and installed to the highest quality. They are also fully tested for durability so you can be sure that they are extremely sturdy and can stand the harshest weather conditions. After the project, we will provide you with aftercare services and will never make you feel abandoned. We provide continuous customer service that goes beyond the completion of the project. We return calls within 24 hours and guarantee that we will be with you on your scheduled appointment. Our tradesmen and fitters work to the highest standards. We are always respectful and on time. With us you will be secured dealing with professionals who have carried out services to the locals of London for many years. Aluminium windows and doors installed at my home in Edgware Road, Great company will use again. awesome company, everything done to standards and in timescale, amazingly bifold doors installed in a single afternoon. Are aluminium windows better than timber? In terms of price they are very similar and its really down to your personal choice of style and finish, but Aluminium windows are maintenance free whereas timber framed will require much treatment and care in the long run. Upvc windows are much cheaper than Aluminium windows due to the material being a metal. That said, Aluminium will be much more cost effective than pvc because it is less likely to degrade over a long period of time. They are the safest material in the industry, will not burn as bad as wood, timber or upvc. When it comes to home security, both timber and pvc can be breached much easier than aluminium. When these frames burn they do not let off as much toxic chemicals as upvc either. Are aluminium windows fire rated? They are not fire rated because Aluminium has a melting point and not burning point so therefore will melt instead of flame up in fire. This depends on the thickness of glass installed and frame applied, always ask the fabricator before purchasing, if you are after the sound proof quality Aluminium doors and windows. How do i repaint aluminium windows? how much aluminium windows cost? The average cost for 4 aluminium glazed windows is between £2,250 and £2,950. There are many manufacturers across the whole of the UK but we would be very silly to not say ‘’call us at Doorwins and we can certainly help you choose the correct windows and doors for your project. Can aluminium window frames rust? Aluminium material does not rust like other metals, however they do corrode. When they do corrode its not a brown substance but a white powdery coat that starts to appear, easily removable and treatable. How to replace aluminium windows? The removal and replacement of the windows and doors should always be done by a specialist, but some builders are known to do this as well and fit the windows or doors themselves. Always keep in mind the procedure of taking out the old units without damaging the frame or brickwork and any sort of sill that may sit below the windows. You can obtain specials tools for this job. Using a garden hose spray the door or windows with clean water and scrub the frame once wet using a special aluminium cleaner or detergent. Wipe down the frames from top to bottom making sure they are dry. You can also use aluminium shine spray after this. Are timber or Aluminium Windows cheaper? Timber is always more expensive due to the process of gaining it, such as tree cutting, filing and other techniques required to obtain and mould the wood into shape. Low maintenance and durability are the two main factors that helps aluminium stand out from other materials. Low maintenance due to corrosion resistance of aluminium doors and windows from harsh weather conditions makes them very beneficial and they will not crack, swell warp or split like timber and upvc. Long guarantees and warrantee periods are very attractive, were as upvc windows and doors are normally 10 years warranted, Aluminium doors or windows are 25 years of guarantee and warranty periods. Nearly double in security with the multi locking systems and thickness available. What different types of Aluminium doors are available? Aluminium Slide & Fold Doors, bifold doors, sliding pane glass doors, casement doors, aluminium front doors, back doors and aluminium lift and slide doors as well as corner less bifold doors are to name a few. Not forgetting office doors, commercial doors and security doors for flats and apartments. how to clean aluminium doors? Use a garden hose to douse your double glazing doors & windows frames with water and then Scrub the frames with a special aluminium cleaner, Wipe down the frames from top to bottom and finally Rinse with clean water and then dry. how to paint aluminium doors? The best way to repaint or newly paint these alu doors are exterior-grade spray-paint with a brush stroke evenly. We have found that to give the best finished results but that doesn’t mean that you cant use normal paint, aluminium is a tough old thing and any paint will stick just fine. how much are aluminium doors? A width of 750 and Hight of 1925 can put you back approx. £1,425.29 so really maters on the size, width, brand of doors or windows you want to invest in, how many locks you may need and thickness of frame with types of glass. If it’s a family home, you will always pay more for extra security and landlords that rent normally buy standard issues. Are Aluminium doors more expensive than uPVC? Yes, aluminium doors are a lot more expensive than pvc due to the metal material and security factors, usually up to 4 times more expensive. What types of glass is available for aluminium doors and windows? Float Glass, Safety Laminated Glass, Obscured Glass, Annealed Glass, Tinted Glass, Tempered Glass, Insulated Glass, Mirrored Glass, Wired Glass, Heat Strengthened Glass are the most common but bespoke design is also available at doorwins. Are aluminium windows and doors safe? Due to durable nature these aluminium windows and doors are very very safe and more so than timber which can be vulnerable to forced entry when they degrade over the years. Always buy the better lock systems if given the option to do so. What styles of Bifold doors are available? Thin, ultra slim and thick are the first things that come to mind with bifold doors and then the number of panes (glass units) such as a 3 pane bifold door or 4 panes of glass were 1 pane accounts for a single folded unit of the bifold. Again, it comes to size and you can always find the correct size at Doorwins.com. What are corner bifold doors? Corner less bifold doors are the newest most pretty things on the market today. Without a full corner of a wall or conservatory the bifold doors once met in the middle make up the corner of that room or extension. Windows and Doors - all guaranteed for a minimum of 10 years and aluminium up to 25 years , Doorwins is a full service company in London that has years of experience in replacement and repair services. In the event that one of your sash windows or doors crack down, we can immediately remove the glass and clean-up the area, and schedule it immediately for replacement or repair services. We will provide you with glass type options according to your needs, and install them quickly when necessary. Our team can answer any technical questions you might have and ensure that your project goes as smoothly and trouble-free as possible.